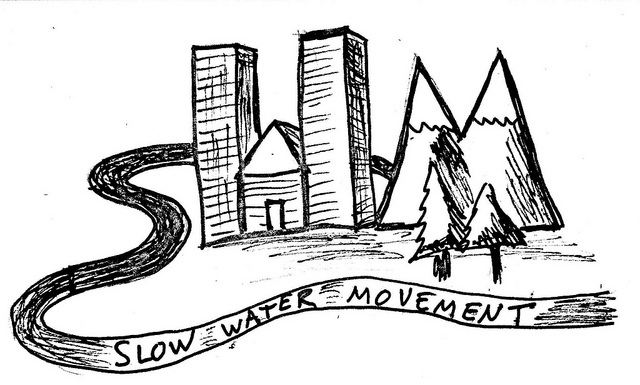 The "Slow Water" Movement: Has the polar jet stream lost track of the North Pole? The polar jet stream has been acting a bit odd lately. 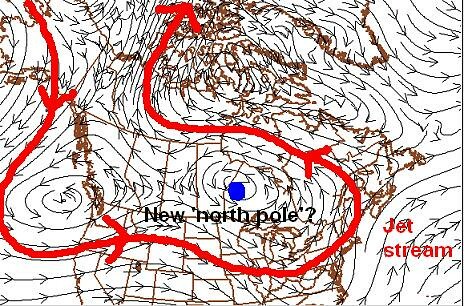 Usually it rotates around the north pole (thus its name). Ripples and waves bring storms to the 'temperate' regions of the Northern Hemisphere; areas north of the jet stream are cold while areas south of the jet stream tend to be warm. Sometimes it splits into two separate streams, or loops of it pinch off, and create 'cutoff lows' (a type of storm that is very hard to predict). Still, it pretty much always makes its looping way with the North Pole as its center. The above picture, from Wikipedia, shows the normal jet stream. Right now though, the jet stream is doing something different. Here's a little map I drew based on a forecast from the 'GFS' weather model. This is the forecast for later this week, which may not come true, but right now the jet stream is already following a similar path. The jet stream appears to be confused, and 'thinks' that the new North Pole is just a few hundred miles north of Minnesota. People in Minnesota might agree - much of northern Minnesota is going to drop below zero farenheit tonight. But it is NOT the north pole. Every once in a while I hear a 'theory' that the Earth's axis is going to somehow shift. This is not going to happen (it violates the laws of momentum, for one thing). That doesn't mean the coldest weather is always at the north pole, though. The current jet stream pattern favors snow in the Northwest, cold in the central part of the US, snow in New England that comes from the east rather than the west, unusually warm weather in Greenland and the 'real' arctic, and extremely snowy conditions in the British Islands. If this sounds familiar, it's because that's what we have been experiencing this last month already! The global weather pattern has been 'stuck' in this amplified phase for quite some time now. What's causing it? Well, according to meteorologist Dr. Jeff Masters, it may be related to the relative lack of sea ice lately. This means the Arctic doesn't get as cold, so the jet stream may try to 'compensate' by rotating around the coldest area on the continents instead. It also appears to be related to the La Nina weather pattern. It could also just be a weird anomaly that pops up every century or two. We haven't even known about the jet stream for 100 years, so there is a lot about long-term climate patterns we just don't know. Either way, the weather pattern will probably stick around until at least the start of January - unless you live in California, where there might be a big storm in the next week (though it's hard to say in which parts of the state). 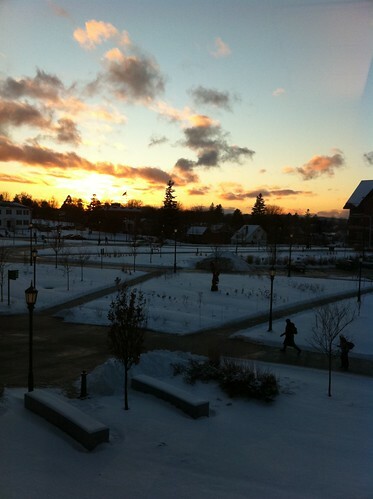 Here in Vermont, it means continued temperatures from single digits to the low 20s, and occasional light snow. it's been a lot colder than last year so far, but the weather changes fast around here, so it may not last all winter.